Hello garden volunteers and supporters! 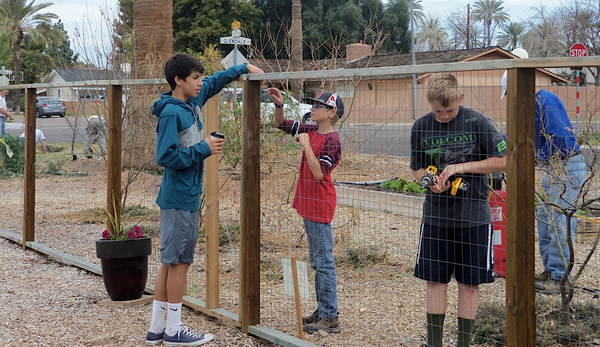 My name is Augie Diaz and I have been working on my Eagle Scout project with Growing Together since August 2012. 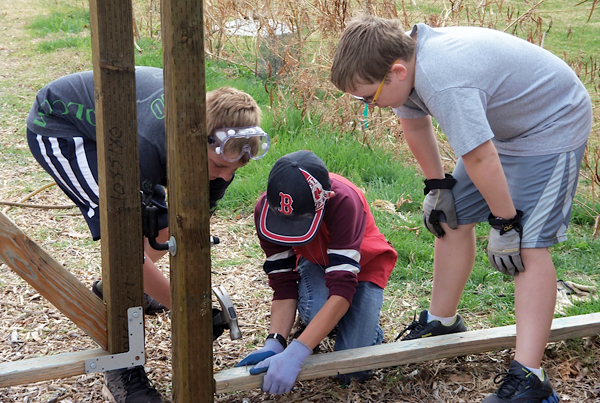 On March 3, 2013 I brought a crew of 33 Scouts, adults and myself to the garden for a work day. My troop began … painting the shed a nice tan color picked by the garden ladies. I came a few days earlier and with the help of two other Scouts we power washed the shed, removed the rust and primed the freshly cleaned areas. With a sprayer the shed was painted quickly and efficiently. Turning that white shed to a tan color really made the garden look nice and fit into the environment much better. While one crew painted the shed, another crew worked finishing the mesh fencing. With a compressor and a stapler, the open sections were fitted with wire mesh to finish securing the garden. During this process the gates were reinforced and fixed so that they would operate better and were more structurally sound. 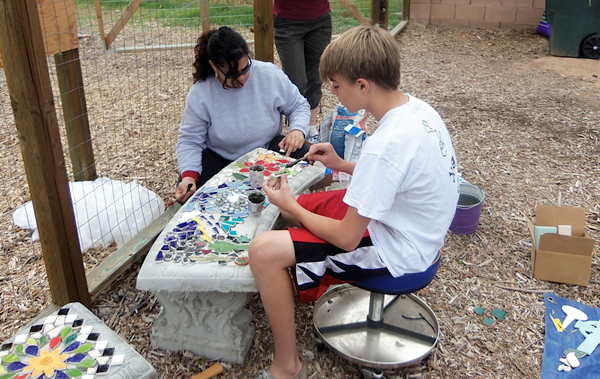 A third crew was busy on what most people probably notice more at the garden, the mosaic benches. 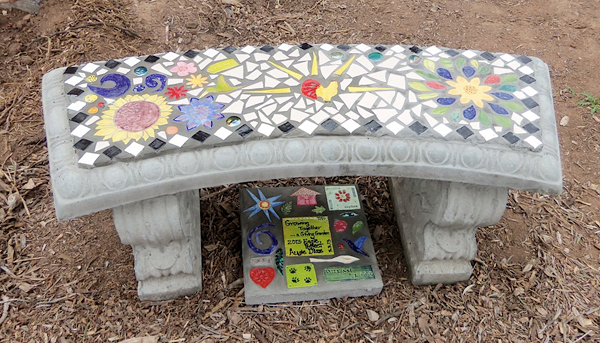 I was lucky enough to find a volunteer who creates handmade mosaic tiles and she agreed to bring some to the garden and help us install two benches with a custom mosaic design. The crew members would worked on this were able to create their own mosaic designs with all kinds of tiles to choose from. These two benches were a nice addition to the garden. We also installed a bit a art in front of the vegetable washing station to mark the two Troop 147 Eagle Projects now completed. Finally, since I had more helpers than I expected (which was great), I was able to direct some additional berm building inside the garden and weeding along Glendale Avenue.We contributed at total of 234 hours to the Garden and it really looked nice to start the spring season at Growing Together. 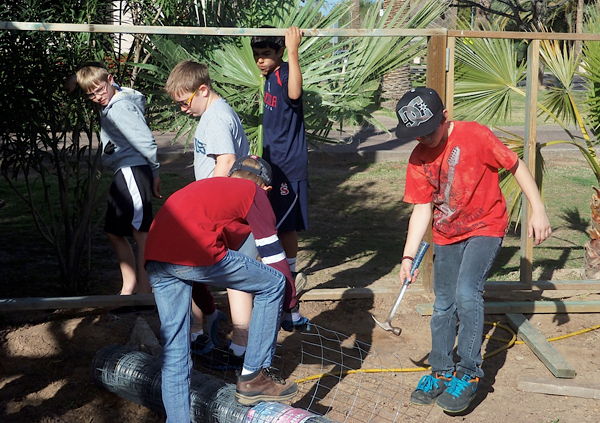 Thank you for allowing our Boy Scout Troop 147 to conduct two Eagle Projects in your beautiful garden. We enjoyed it and I drive by the Garden all the time and I feel like I contributed to my community. When finals are over, you will see me and my brother at a few of your work days!